As the title suggests, Histories of the Future Perfect focusses largely on memory and history, and more generally on time itself. Memories of childhood and the dead are interspersed with accounts of the imagined experiences of mythical, literary, and historical figures as diverse as Persephone, Juliet, and Mary Todd Lincoln. Captured moments from the past and future and loops of experience fill these pages. Written in verse that flows and skips from line to line, favouring enjambment and plain speech (though not lacking literary flair), these poems are open to the reader. They bring the universal (quite literally, when the poems discuss the sun and outer space) down to the individual level. The whole world becomes the speaker’s world, a singular subjectivity defining all: “the whole world/spins when I spin” (“On the Electrodynamics of Moving Bodies”). This movement from macrocosm to microcosm (and sometimes back again) takes many forms. Kombiyil takes scientific discourse and renders it colloquial: “If in moonlight Y flings a beer, then I in unison flick my hair” (“Outgrowing: an equation”), and time ceases to hold its shape in “a place where sea once covered/my bones and a sequined girl/circumnavigates trilobites etched in stone” (“On the Electrodynamics of Moving Bodies”). All this is done with an underlying awareness of a distortion of scale (the line quoted above ends “or their illusion”). I cannot speak with authority on the accuracy of some of the scientific imagery, and the scientifically minded reader may find the application of such imagery somewhat liberal in some cases. This is, after all, a poetry book, not a textbook, and one that uses all source material to express feelings rather than hard fact. Kombiyil draws on eclectic sources, from entropy to tarot, and uses them to construct the universe of the poems however she chooses. Overall, this equation of macrocosm and microcosm, science and personal reflection works, particularly in pieces like “Wave Oscillation as Time Loop”, where swimsuit bottoms and astronauts inhabit the same poem. The simultaneous suspensions of immersion in water, outer space, and time feel like appropriate, almost necessary, parallels: “sun flanked by black it flashes past/spinning before reentry”. 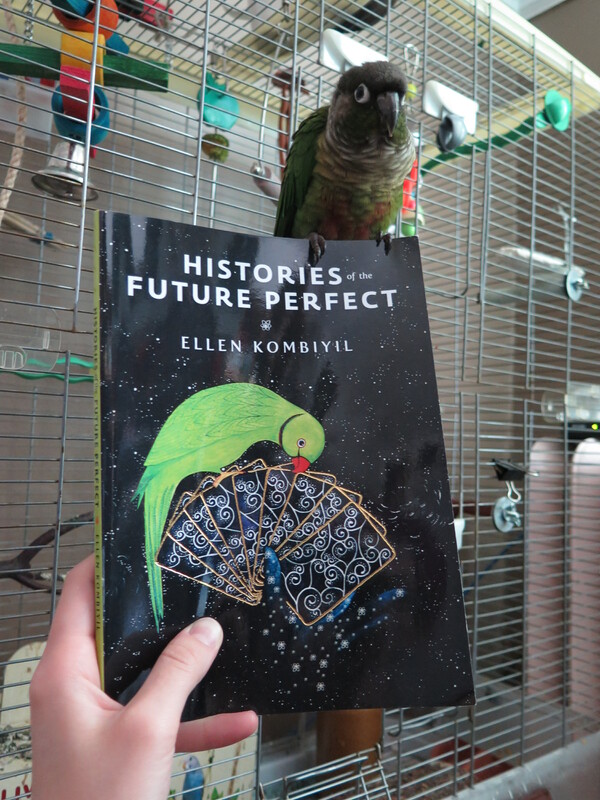 An ambitious and intriguing collection, Histories of the Future Perfect is worth a read. The end of the night. Maybe half of the audience is still in attendance–it was crowded! If you’d like to learn more about the poetry tour, you can visit their blog at worstcaseontario-tour.tumblr.com.